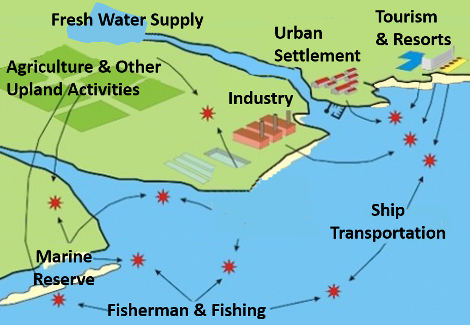 Integrated Coastal Zone Management (ICZM) is defined as a process that joins together everyone involved in the management, development and use of the coast within a structure that enables the integration of interests and responsibilities of all involved and effected. The objective is to establish maintainable levels of economic and social activity in the defined coastal area(s) while protecting the coastal environment. ICZM is essential to the ecosystem-based approach. ICZM is essential for coastal areas that include land development, local resources, pollution management and more. Proper planning and management helps resolve issues and conflicts that occur within a locales' realm consisting residents, businesses, developments, transportation, recreation and agricultural interests ...all co-existing within the same proximate space. The closer the physical relationship between marine resources and coastal tourism, the greater the likelihood resources will be depleted and ecological systems within coastal zone adversely effected. In turn this effects the functionality of local services and economics. The history of coastal occupancy and development around the world shows a pattern of depletion of coastal resource and loss of biodiversity. ​Without solid planning, critical habitats have been destroyed, ecosystems disrupted and water heavily polluted. Applying the proper coastal zone management techniques this trend can be avoided and or reversed. With appropriate Integrated Coastal Zone Management planning and action coastal communities can both conserve and replenish natural resources while invigorating local economies.